With the growing list of applications of unmanned aircraft vehicles, it was only a matter of time before high tech farming came to St. Johns County. But don’t call them “drones,” which brings to mind killing machines. As Scott Graddy of Ag-Tastic Solutions explained recently to members of the St. Johns County Chamber of Commerce’s Agricultural and Environmental Council, these high tech field scouting machines are best called UAVs or unmanned aircraft vehicles. 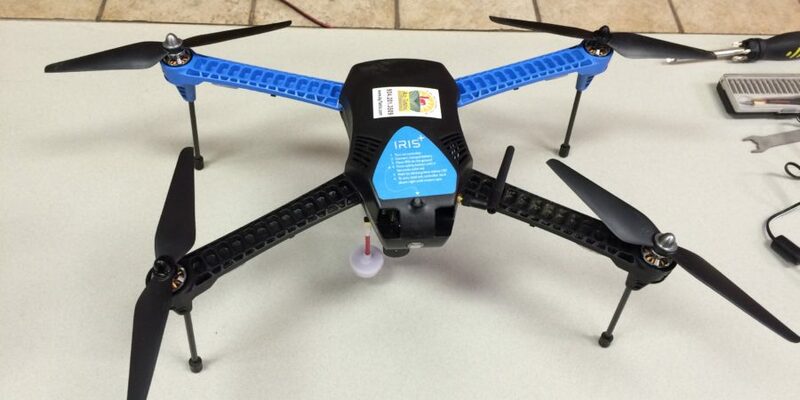 “UAVs are the next big disruptive technology for agriculture. It can be compared to the transition from steam to combustion engines,” Graddy said. Chief among their advantageous uses are their ability to take real time high quality aerial photos (when equipped with a camera such as a Go Pro) that can provide farmers with rapid reaction to pest threats. Also, there is no compaction of soil or spreading of diseases as with using a tractor to survey fields of crops. A forward looking infrared (FLIR) camera mounted on a UAV provides the best information for plant health, allowing farmers to identify early on when plants are stressed so they can stay ahead of disease and nutritional needs. Common types of UAVs include fixed wing, which require a landing strip, and copters. The copters have several configurations of props, including an octo prop, which is extremely stable and well suited for agricultural purposes because of its ability to take off and land vertically as well as hover. Operators can program a “mission” with software included with the UAV that will direct the vehicle to cover fields by finding a series of waypoints. Graddy pointed out that although UAVs can be flown manually, the computer can do a much better job of flying than a human. Agriculture is one of the few industries that has the green light for UAVs, but after a December 2015 ruling by the FAA, owners still must register their vehicles. Failure to do so may result in civil and criminal penalties. Farmers may fly a UAV over their own land, but UAVs for hire require the operator to have a pilot’s license. With a modest price tag, a UAV can pay for itself rather quickly when compared to the expense of wear and tear on an a tractor or the cost of hiring a pilot to fly a plane over fields to perform scouting missions. And as for the future? Graddy said he believes that unmanned ground vehicles (UGV) or autonomous tractors are next. Graddy also told the group that Japan, which is ahead of the U.S. in its use of UAVs, recently announced the world’s first completely robot-run farm, which will be able to plant and then harvest 30,000 heads of lettuce daily.